although i am never one to complain about all of the little balls of wool that fill up my stash… this is what others might call a stash busting hat. i wrote this playful little pattern down as a toast – in celebration of life in a new place, a space for all of my wool, and a hopeful business expansion. but seriously, little balls of wool in many colors organized and ready to be matched up together in interesting ways? how could i resist? plus, it’s autumn and that is the beginning of hat weather. yay! -in this one i used two mountain colors mill ends, cascade 220, lamb’s pride and some of my hand dyed recycled sweater wool. size: 18 mo. – 4 yr.
not sure if you have enough yarn in one ball? no biggie. the purl ridges of this pattern easily hide any small discrepancies in the width of the stripes. i sometimes vary them on purpose to cover it up more and to use yarns i really think need to be in the hat but i have less of. smaller stripes work too, like on this hat. i also have been known to just knit until i run out of wool and then move on to the next color. your goal height for this hat is 7 ¼-7½ in. (18.4-19.1 cm), that means that on this version each stripe is approximately 1 ½ in. (3.8 cm) wide. width-wise, the goal is 9 ½-10 in. this hat tends to fit around the head as opposed to beanie-like tight to the head. 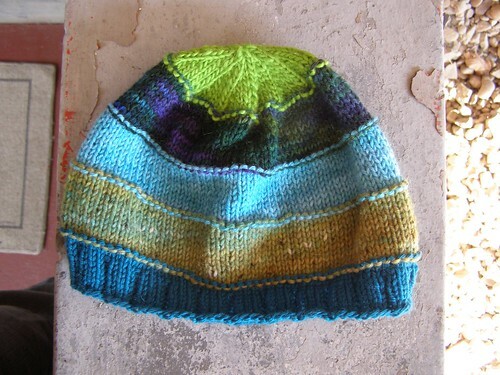 for that reason, if you want to up the hat size (4 yr old to adult small – approx 21 in. head), you can keep the cast on number the same and increase your height goal to by about an inch. if you want a smaller size (6-18 mo. – approx 18 in. head), you’ll need to subtract 8 stitches from all totals and make it about an inch shorter. switch to stockingnet stitch until the entire piece measures 1 ½ in. in the midst of the fourth color section, when the entire piece measures 5 ¾ in, start working the decrease rows. when you have 6 stitches left, cut a 6-8 in. tail, thread the tail onto a tapestry needle and pull through the live stitches. pull inside of the hat, knot and sew in the end to secure it. sew in the rest of the ends and you’re in business! 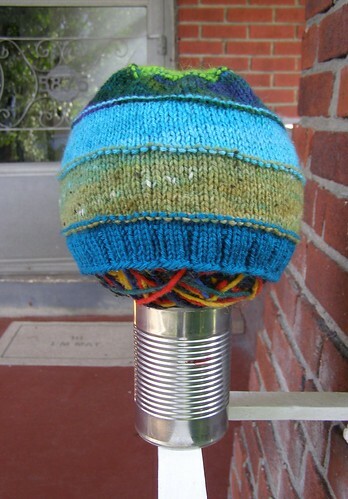 This entry was posted in cosyknitsliterally, free, hats, knitting, patterns by cosymakes. Bookmark the permalink. Love the colors! Especially the green up top. Also I really love the swirl finish. Very nice. Great job & great idea! I love the bright green swirliness right at the top. :D Good stashbusty project idea, too! Thanks for the pattern! Both of your Scrap Happy hats are just too cute, and you have a really great eye for color. Must add this pattern to my Ravelry queue!!! woo i’m celebrating right with you! i’ve made 5 hats in the last week and a half – i think it’s the move/new studio and the sudden weather change and being able to knit at work all combining to make me hat-crazy. i was just planning a pattern to post on my blog on my drive home today, i’m gonna follow your lead and start posting free patterns when i think i have a decent one. your work is always so inspirational, and you are indeed brilliant with color design! and your yarn room rocks! yeah! your stuff is always the greatest, everything is just so beautiful! i really need to learn how to knit someday. Blessings on your new nest! Great hat! I love the purl ridges on the color change rounds! Hi, I was just wondering if you had any policy on whether or not someone could create this hat and then sell it for profit. Love this idea! I’ve been using my Phat Fiber samples to make a hat with a Lion Brand pattern, but I like this better! thanks for the nice compliment! glad you’re enjoying the pattern. hi. I am excited to try this pattern very soon. I saw on ravelry that it said you have comments on how to make an adult one. I am having a hard time finding those comments. Can you give me a link to it or something? I would appreciate it. Thanks for making such cool stuff. for a larger size – adult m/l, cast on 100 and add 1 3/4 in. to the size before the decreases. you’ll need to decrease 4 sts the row before you start the official decreases. Hi! I take apart thrifted sweaters or sweaters with holes in them and re-use the yarn, usually dyeing it first. 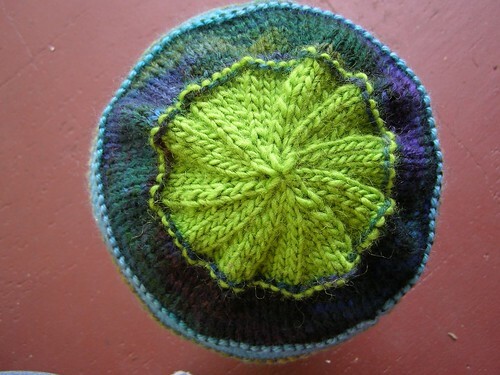 Pingback: Scrap Happy Hats galore – my first knitting project! A teacher friend says schools always need hats for kids that come without so I’m going to try sizing these up for grade schoolers. I’m burnt out knitting preemie hats. Hats and mittens for grade school kids now! I found your pattern on ravelry. When I get to the purl ridge row I am left with a gaping hole where I start the new color. How do I stop this from happening? Thanks! Can you use sock yarn?